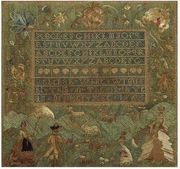 In the first half of the eighteenth century, as in the entire seven­teenth, New England furnishes by far the largest number of samplers, followed by Long Island, New Jersey, and Pennsylvania. It is, perhaps, inevitable that, as the material has been collected from Boston as a center, New England should have been more easily reached and more prolifically represented than are other parts of the coast. The girls of most of the great nations of Europe worked samplers, quite characteristic and differing in their basic essentials. The Spaniards brought the art to Mexico, but neither the early Dutch nor the early Germans seem to have brought their particular form to this country. In the late eighteenth and early nineteenth centuries in certain localities—such as parts of Pennsylvania—a certain Dutch or German influence can be seen, but it is quite rare; so we are really left with a very clear-cut result. We have first a century of imitation of the old English model, good but gradually degenerating, followed by a very distinct type of American sampler. It is the development of this second type with which we now have to do. It is inevitable, as one considers the schools of this century, to feel that the samplers, like the schools, fall into two classes. where the very young were taught, and where the samplers done by these small hands were very simple things indeed. And so we have the commonest form of sampler, that which contains merely alphabets and numbers. Not much from an artistic point of view, we shall all agree, but very much as an indication that our ancestresses got a little learning, meager though it was. This sampler must have been a wonderful assistance in driving home to the weary, childish brain the letter learned from her horn-book primer. 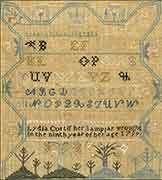 And so we have poor little Mary Smith, in her sixth year, in 1714, working a simple form of the long sampler, with one large and one small alphabet. It was done on fine linen, and contained that most frequent of all verses, "Mary Smith is my name and with my nedel I wroght the same." She is not, by any manner of means, the only child of five who worked a sampler at this time. The other form, done by the older girl at her finishing school, was, as a rule, a more elaborate object. Quite early in the century, originality began to be shown. 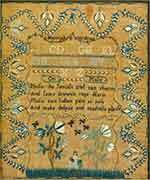 Take, for instance, Mary Leavitt's sampler, done in 1718. Having accomplished the stupid task of em?broidering four sets of alphabets separated by the simplest of cross-borders, she then, at the bottom, made a nice green hill, with one fair plant upon it, and "Ashur" and "Elisha" in long-tailed coats, white stockings, and black shoes, dancing and playing pipes thereon. 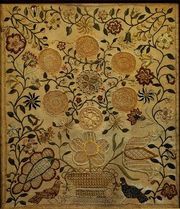 Mary Leavitt was a Salem, Massachusetts, girl; and that same year Eunice Bowditch, another Salem girl, embroidered a sampler, but she did not have Mary's originality. 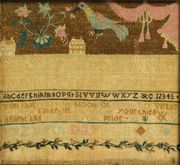 the first example of a border as a frame By 1721 we may feel that the real American sampler is with us, for in that year Mary Daintery, aged eight, embroidered a sampler broader than it was long, and put a border all around it. 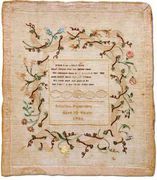 This is the first example of a border as a frame which has come to our notice on an authentic American sampler, though of course there may be earlier cases. In the upper center stands the figure of Christ, and all around and beneath is "PUBLIUS LENTULUS his Letter to the Senate OF Rome Concerning JESUS" . 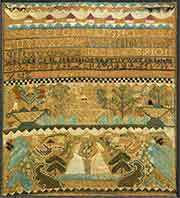 This fascinating sampler is owned on Long Island, but came from a farmhouse near New Haven, Connecticut. Until 1730, with this one exception, the samplers and the alphabets are separated by very simple cross-borders, with little or no design. A few had framing borders. The childish hands were not able to make the lovely, compli?cated "Indian pink," the rose, and "Tree of life" that the older girls of a previous century had done so beautifully. So we have simple strawberry, acorn, and Greek frets, varied occasionally with a vine made free-hand. One small girl, in 1724, Mary Frye, made a cross-border of hearts, and her biographer tells of her that "she was an orphan from infancy, but an heiress and a belle, if a devout Quaker maiden can be called a belle. When young Samuel Willis fell in love with her, he found he must win her from many competitors. But he had this in his favor, she was his father's ward and was dwelling under his father's roof." 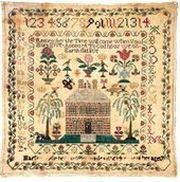 In 1730, Pennsylvania contributes a wonderful sampler; it is only saved from ostracism as a needlework picture by the fact that Mary or Martha Bulyn signed and dated it. Thus early in the century does the decision as to what a sampler is and what is a needlework picture have to be made. The needlework picture of the period, like many that preceded it, was done all over the linen canvas in either petit-point, cross-stitch, or, occasionally, tent-stitch. This form of needlework had been done in England since the days of the Conqueror. Our ancestors, lacking pictures and feeling the need for some form of wall decoration, used the needlework pictures and samplers in that way. The story has come down to us of one little girl who left out her middle name when she worked her sampler. She put the initial in up above, but her parents were so annoyed at the omission that as a punishment they refused to frame her sampler. Poor mite! she may have hated that middle name as many of us hate ours to this day. To return to our muttons, an arbitrary ruling was felt to be necessary to distinguish between these two forms, and so all needle?work signed and dated by the maker has been accepted as a sampler. Thus we have had to eliminate much that was lovely and interesting. Mary Bulyn's sampler is of a shepherdess beneath a tree, surrounded by her flocks and dogs. The perspective is what one expects on a sampler of any age; the flowers are much bigger than the sheep, and the birds that roost upon the tree inevitably, in any other world, would tear it limb from limb, so large and fat are they. But it is most charm?ing. Just at this same time, Pennsylvania gave us another form of sampler. Two lines of verse and then a rather elaborate cross-border, in some cases returning to seventeenth century design; then two more lines and another border, and so on, the whole framed in a simple border or not, as the case might be. This precise form appears but once after 1735, though the alternation of verse and cross-borders in other mixtures does appear spasmodically. 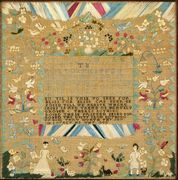 The exception is Ann Tatnal's sampler, done in Delaware in 1785; and it is so like the Pennsylvania ones, both in form and detail, as to make us suspect that she copied an early one. Even from the beginning, when Loara Standish put her short verse upon her sampler, pious verse was always an adjunct. Verse was not inevitable; sometimes there were prose quotations of a religious nature, often the Lord's Prayer, the Creed, or a metrical version of the Ten Commandments. The Lord's Prayer and the Creed were most frequently done in a form to reproduce the tablets to be seen, during the eighteenth century, in the east end of English and American Episcopal churches. Hannah Trecothick, of Boston, did one such in 1738, and she had many followers. 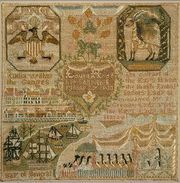 Sampler by Nabby Goss, Salem, MA, 18th C.